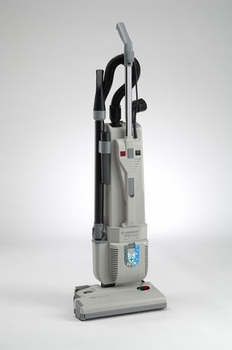 The Lindhaus RX HEPA 380 Electronic 15" Commercial is an essential and highly efficient tool in the maintenance of an optimum environment in your healthcare or other commercial facility. Designed to incorporate Filtrete media from the 3M Company, the five stage filtration in a completely sealed system effectively controls particulate and biological contamination. Where even greater filtration is required, the RX HEPA 380 Commercial can be used with their optional Certified HEPA Exhaust Filter. Sound and frequency levels are reduced by the innovative use of sound-deadening materials and precision motor technology. It is easily the quietest, while delivering the highest levels of efficiency. Ergonomic engineering provides the highest levels of operator comfort, reducing user fatigue and increasing productivity. 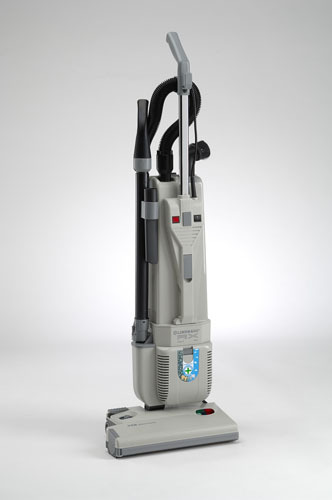 The RX HEPA 380 Commercial is the only vacuum cleaner engineered exclusively for the specific needs of the healthcare facility. It is equipped with the most sophisticated technical features in the world. You'll find this amazing two-motor upright to be loaded with many advanced features which are not available on most commercial uprights.